Cabinet was later braced with hardwood strips to increase rigidity, compensating for the thin wood. 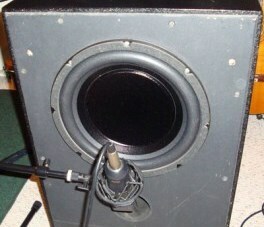 The baffle was replaced with 3/4″ MDF for better mounting of the woofer. However, it did in fact produce some big lows! 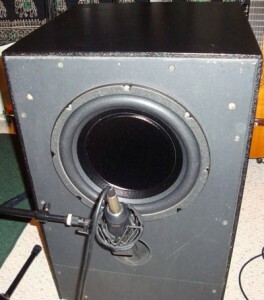 An upgraded woofer was chosen based on software analysis to eliminate the under-damped condition and extend the frequency response to as close to 20Hz as possible without re-tuning the cabinet. 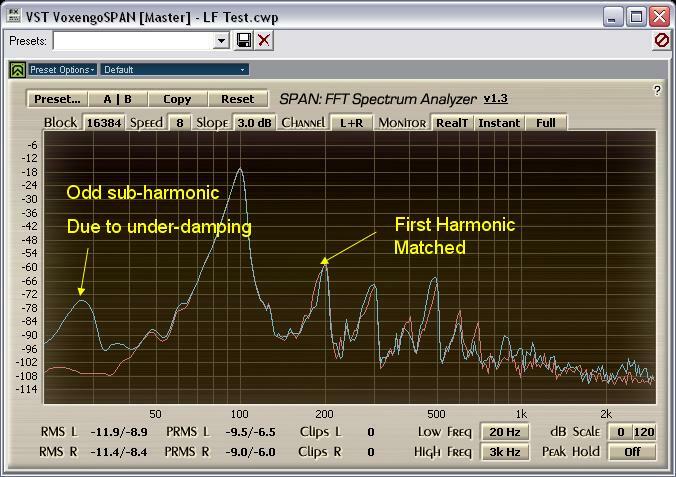 On the left, the Pyramid Super Blue and on the right, the Eminence Lab 12. Now that’s a woofer! A high quality large diaphragm condenser microphone was used as the measurement device. This isn’t as good as a calibrated reference mic, but would do fine for relative measurement. 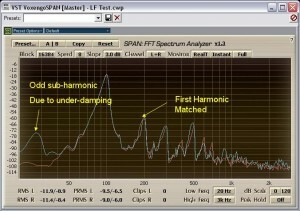 A FFT spectrum analyzer (Voxengo SPAN) was used to analyze the recorded outputs. Wait, what’s “close mic” technique? 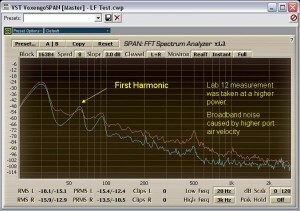 The measurement distance is approximate, and some adjustment may be necessary to get a good result. 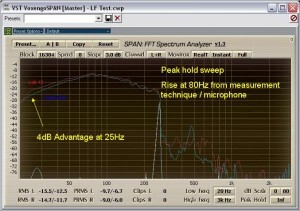 Measurement is dependent on the performance of the microphone and any proximity effect caused by placing the mic within inches of the speaker. I did not have a measurement point on the actual voltage going to the driver, so power levels were not controlled during the comparison. 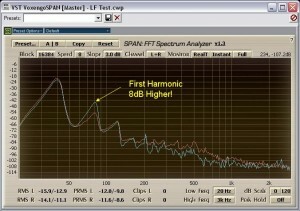 This leads to some variation on noise and distortion levels. Frequency response was surprisingly similar between the woofers. There is a distinct 4dB advantage at 25Hz with the Lab 12 woofer. The real advantage becomes apparent when looking at the distortion of the woofers by watching the harmonic content. At 30Hz the Lab 12 woofer is already showing an advantage in harmonic distortion, in spite of a large disadvantage caused by the higher power input during measurement. All measurements across the subwoofers intended range show the Lab 12 woofer has a huge advantage with a much lower harmonic output. The difference in the first harmonic was about 8dB across the band. An interesting anomaly occurred as the Super Blue woofer approached 100Hz. A 1/4 sub-harmonic appeared. 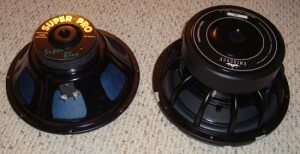 This is most likely due to the heavily under-damped condition the woofer was operating under. The cone was out of control! The upgrade is a success! 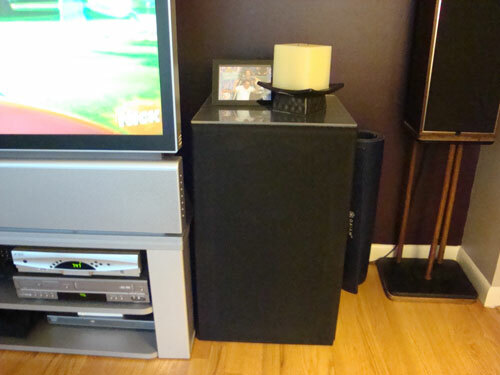 Even if my wife doesn’t care one bit and only 5% of anything I ever play through this beast of a subwoofer demonstrates the improved output, I feel the data speaks for itself and I have one hell of a woofer. After applying the grill and putting in it’s natural habitat, it can go back to a life of patiently waiting for that 25Hz signal to wake it from it’s sleep.